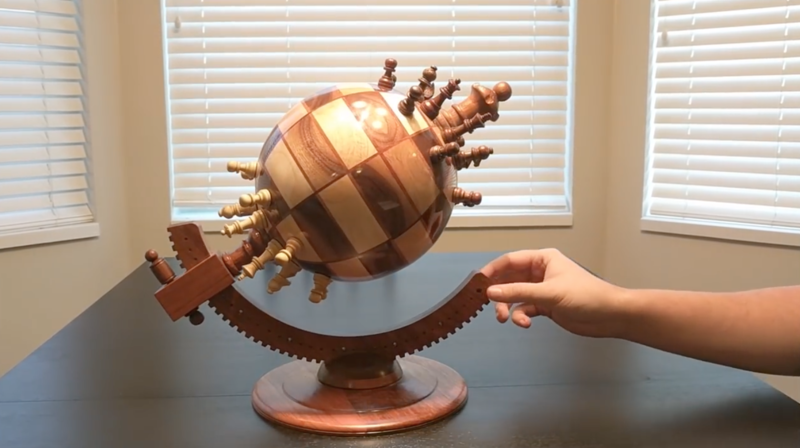 This isn’t the first time we’ve seen a magnetic chess board, but it’s probably one of the more innovative takes on the game: a globe-shaped board. A design student named Ben Myers created the unique board with his father. He posted his process on Instructables, noting that he made the board out walnut, soft maple, and Jatoba wood, which he measured out and cut to exact dimensions and glued onto eight octagonal rings. Each space has a magnet embedded in it, and once he glued each side together, he used a lathe to turn it into a sphere.